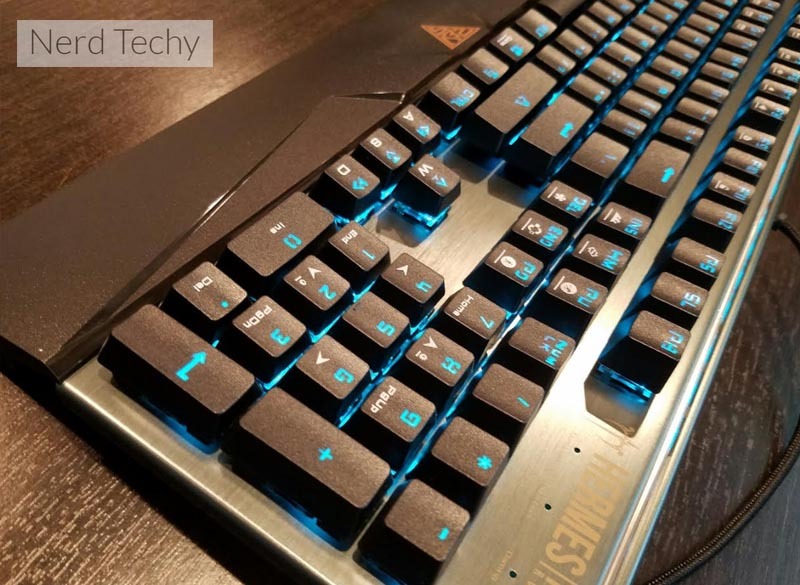 We’ve looked at several gaming keyboards before, and found that the original edition of the Gamdias RGB mechanical keyboard was one of the best deals on the market. 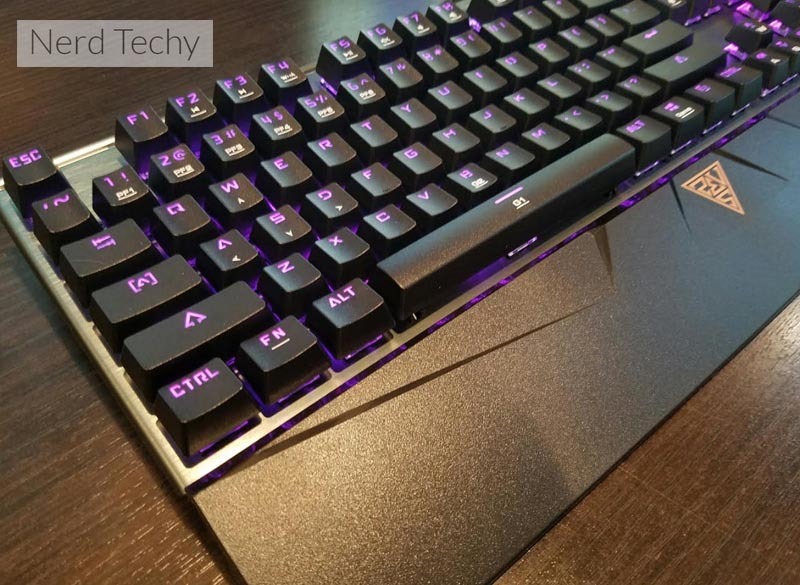 If you haven’t used a mechanical keyboard before, we highly recommend you consider it. Both gamers and casual typists swear by these keyboards. It’s one of those things that once you’ve tried it, you’ll never be able to go back. In fact, this review is being written on a mechanical keyboard right now. If you’re read through our website, you’ll see hundreds of thousands of words, each of which were hammered out on the incredibly clicky mechanical switches. Today, we’ll be taking a look at Gamdias’ latest offering, and finding out first hand if this is the new king of affordable mechanical keyboards. 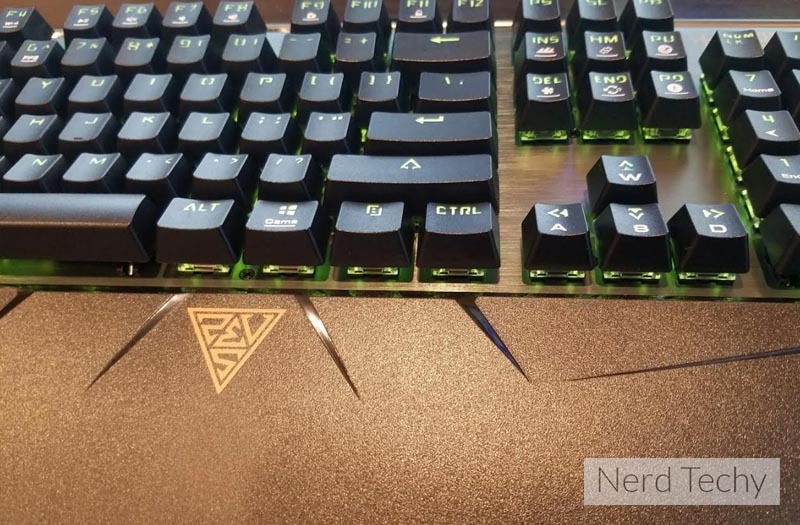 If you’re shopping for a gaming keyboard, you’re likely looking for something with an aggressive design that can show your competitors that you’re a formidable opponent. In this regard, the Gamdias Hermes P1 doesn’t disappoint. The most notable visual feature is the brightly lit RGB LED keyboards. The coloring is entirely customizable, letting you choose exactly the type of look you want. Although the key caps are dark, the lettering is clear allowing the light to shine through. 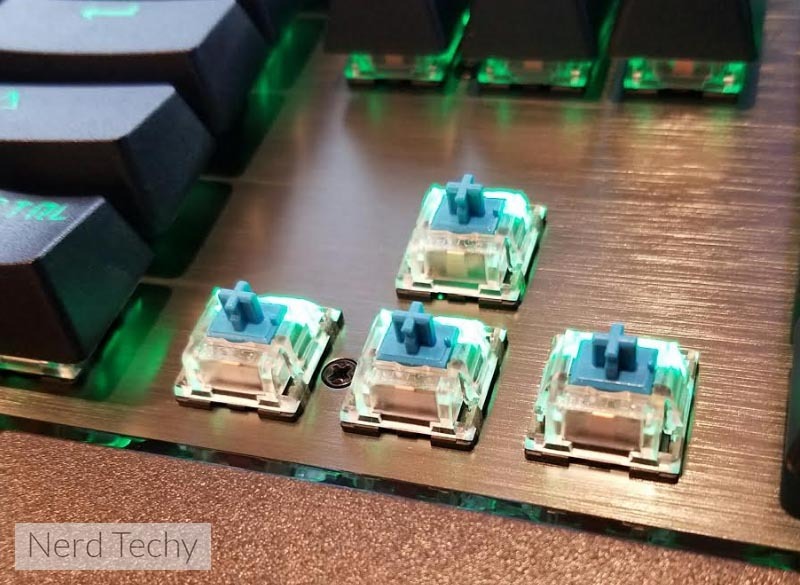 They are raised a little more than your typical keyboard keys, allowing the LEDs to surround the key in a way that creates a bit of a halo effect. Lighting aside, the frame of the keyboard is also designed with a unique visual appeal. In our opinion, it’s the best combination of aggressive and professional that you can find. From a distance, it only looks a little better than you typical high end keyboard, but when you see it up close you know that there is more to it than meets the eye. This hint of mystery is what we believe makes a product like this appealing. When something is too ‘in your face’, it removes the desire to lean what it has to offer. A common trend we’ve seen in the gaming industry is manufacturers making their products a little more subdued. In today’s marketplace, the visual appearance that Gamdias embodies is a symbol that a company is up to date, and knows what gamers want. People buy mechanical keyboards because of the feel. Chances are, you’re not consciously thinking before you hit every key. For many of us, this process has become automatic. This is possible through muscle memory. It’s the feel of a key hitting the bottom of the keyboard that tells your fingers that a key has been actuated. The thing is, typical keyboards aren’t very good for this. Your average keyboard has rubber dome actuators. When you push down the key, the rubber dome collapses and they key makes contact with the sensors. Mechanical keyboard work a little differently than this. They all contain a spring and a mechanical device that physically buckles when pressed. The result is a solid tactile feeling and an audible “click”. It takes a few moments to get used to, but most users notice a significant improvement in their ability to type. Personally, we notice that we’re able to type about 15 to 20 percent faster than before, with fewer errors. But not all switches are made the same. Many are designed a little differently, allowing buyers to choose the exact keyboard that best meets their needs. Switches are color coded so you know exactly what you get. Some gaming keyboards use MX Red switches, which are often sold as being “gaming” switches. The catch is that red switches aren’t quite as “clicky” as the original Blue ones, and are a little cheaper to manufacturer. We use exclusively Blue switches, and that’s exactly what Gamdias uses in their Hermes P1 keyboard. They have their own in-house manufacturer that makes the switches, which is the only reason you’re able to get such a high-quality keyboard for such a low price. Whether you’re buying a mechanical or a standard keyboard, something that’s essential for gaming keyboards is N key rollover. The problem with most keyboards is that they use simple microprocessors that aren’t all that powerful. In fact, you might be surprised to learn that the standard CPU used in most keyboards was developed in 1994! These processors suffer from an issue known as 6 key rollover. They can only buffer a total of 6 keys pressed at any given time. If you press a seventh, the key won’t be sent until you release one. When it comes to gaming, timing is everything. Having your keypresses delayed can seriously mess up your session! Gamdias uses a Cortex M3 processor in their keyboards. Yes, this is the same CPU that was used in some smartphones a few years ago. It supports what’s called “n-key rollover”. This allows the keyboard to use multiple buffers, ensuring that every key press is sent in real time. There is absolutely no delay, so this is the Cadillac of keyboard processors. Another benefit of the high-end processor is the ability for you to use custom macros. There are two buttons on the keyboard labelled G1 and G2. These are your macro keys. They work by pressing the FN key, located just to the right of the control key, then pressing either space bar or the B key. The first time you set up these macros, you’ll have to enter them. Just press the macro combination, then press keys in any order you like. You can use it to change your weapon and reload, or perform a certain number of attack and defend actions in an MMO. Keys are stored using the exact timing you use, and can be as complicated as you like. From this point, every time you press this combination of keys you’ll automatically replay the macro. G1 and G1 can be reprogrammed on the fly, so this is something you can factor into your gaming sessions. The keyboard also supports pre-set macros using the PPF buttons located along the 1 – 6 keys located across the top of the keyboard. These work the same as macros, but can be configured in advance. If you’re regularly changing games (and let’s face it, who isn’t?) or sharing the keyboard with other users. You can easily set separate profiles. Let’s say, for example, that you’ve got the perfect macro set up for your favorite MMO. Later, you want to switch to a first person shooter. Just load a new profile, and all your macros from the MMO will be saved and put away for later while the macros for your new game will be loaded. You can have up to 8 different profiles, all of which are stored on the keyboard. Even if you leave and head to a friends place, you’ll be packing your secret gaming weapon with you – no configuration required! Most RGB LEDs are capable of producing 64 different color combinations. With this Gamdias keyboard, the voltage to each individual sub-LED can be varied. This means that it can produce 16.8 million different color combinations. This is just as good as most LCD monitors! The look of your keyboard can be controlled using Gamdias’ powerful HERA software. HERA lets you choose from several pre-configured lighting schemes, or you can control your own! Our personal favorite is “breathing”, a color scheme where the light slowly fade in and out, each time bringing up a slightly different color than before. You can also select certain keys and light them differently than others. For example, one of our go-to moves is to highlight the WASD keys to make our gaming sessions easier. There are literally hundreds of designs to choose from, or you can create one from scratch. With endless possibilities at your fingertips, this is clearly one of the best keyboards on the market. As much as we love this keyboard, it’s not quite perfect. The LEDs are BRIGHT. 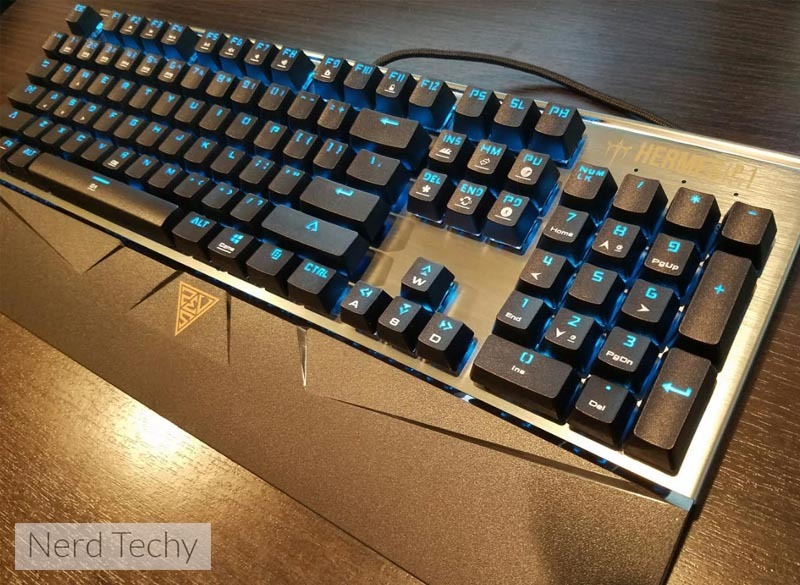 If you’re looking for a stealth gaming keyboard, this might not be the choice for you. We also have some concerns about durability. This isn’t to say that it’s on the verge of wearing out, but Cherry brand switches are rated for millions of actuations. This means that they keys can literally last for 10+ years. There are still IBM model M keyboards from the mid 80s that are kicking around. Although this is a high quality keyboard, we sadly won’t know how long it lasts until a few years down the line. 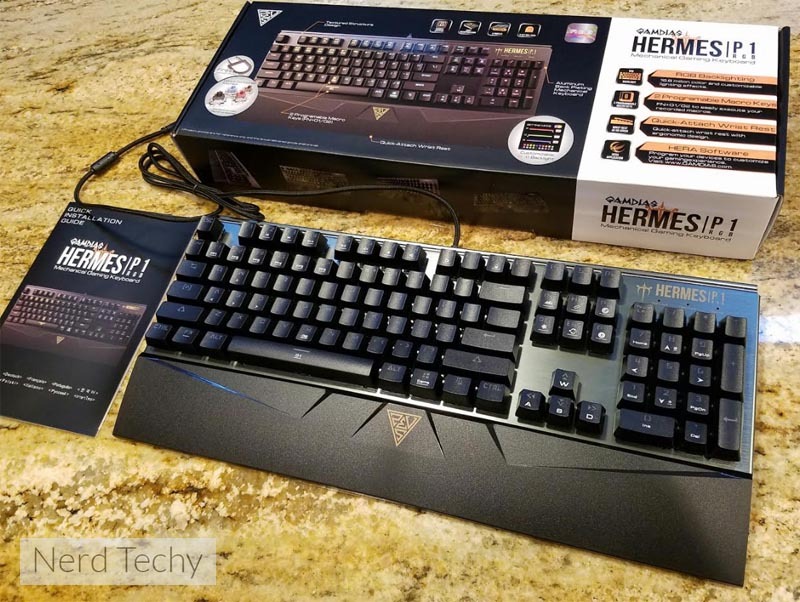 If you haven’t yet come over to the dark side of mechanical gaming keyboards, the Gamdias Hermes P1 is an obvious buy. It’s one of the most affordable mechanical keyboards on the market, and makes virtually no compromises. 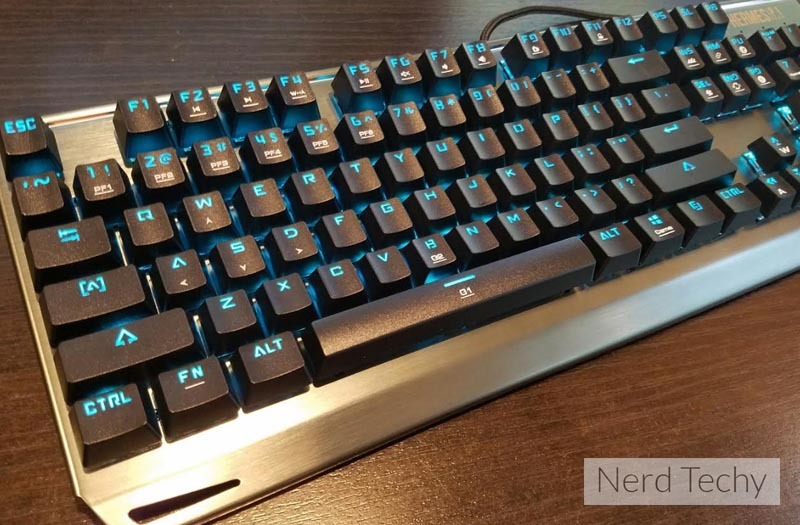 If you’re already using a mechanical keyboard, we’d still recommend it based on the powerful macro system and custom lighting. We’ve used keyboards costing many times the price of the Hermes P1, and we still find this to be competitive. If you already own the original Hermes, you probably won’t notice a huge upgrade from the previous model. They’ve updated the CPU and improved the macros, but not quite enough to warrant a new purchase.